Given a set of points in the plane. the convex hull of the set is the smallest convex polygon that contains all the points of it. 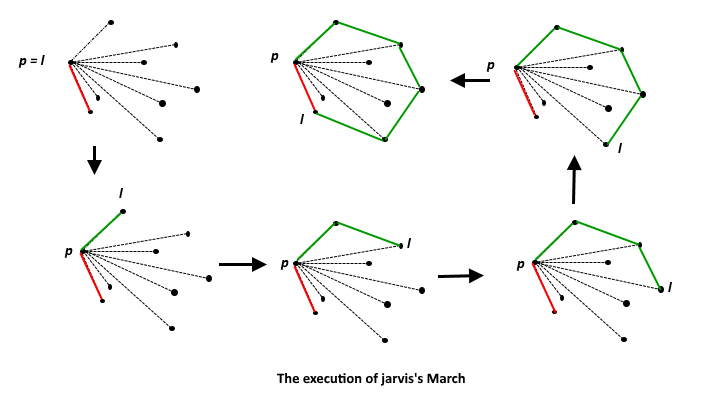 The idea of Jarvis’s Algorithm is simple, we start from the leftmost point (or point with minimum x coordinate value) and we keep wrapping points in counterclockwise direction. The big question is, given a point p as current point, how to find the next point in output? The idea is to use orientation() here. Next point is selected as the point that beats all other points at counterclockwise orientation, i.e., next point is q if for any other point r, we have “orientation(p, r, q) = counterclockwise”. Following is the detailed algorithm. 1) Initialize p as leftmost point. 2) Do following while we don’t come back to the first (or leftmost) point. …..a) The next point q is the point such that the triplet (p, q, r) is counterclockwise for any other point r.
…..b) next[p] = q (Store q as next of p in the output convex hull). …..c) p = q (Set p as q for next iteration). // Prints convex hull of a set of n points. // times where h is number of points in result or output. // wise than q, then update q.
cout << "(" << hull[i].x << ", "
// number of points in result or output. // counterclock-wise than q, then update q. Output: The output is points of the convex hull. first_page How to check if a given point lies inside or outside a polygon?